Nokia 770 Internet Tablet is a wireless touchscreen Internet appliance from Nokia which is designed for wireless Internet browsing and Internet communications such as calling and instant messaging and e-mail functions, and includes software such as internet radio, an RSS news reader, image viewer and media players for selected types of media. Nokia 770 is maemo-compliant, runs on Linux OS, supports 800×480 with 65K colors, integrated WiFi and Bluetooth. MobileBurn (dead link) reviewed Nokia 770 and highly recommended Nokia 770. MobileBurn concluded that “Nokia 770 can do a lot of things, it is open source Linux based, fits easily in your hand, and can connect to the internet via WiFi or Bluetooth. But is it something you need? Nokia hopes so. While I am not sure that it will have the mass market appeal that a DVD player does, I am quite sold on the idea for at least a subset of the consumer electronics market. If you like computers, the internet, and gadgets, this is something you are going to love. CNet gives Nokia 770 mediocre rating of 4.9 out of 10 and concluded that the reasonably priced Nokia 770 is a neat idea and a slick device, but slow performance and a few missing features keep it from realizing its potential. 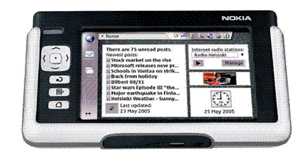 The good: The Nokia 770 boasts a gorgeous, high-resolution screen that makes stunning Web pages. It has a full-featured Web browser and an e-mail client, plus it supports Internet radio and RSS newsfeeds. The 770 is attractive, easy to use, and great at detecting Wi-Fi hot spots. The bad: The Nokia 770 suffers from extremely sluggish operation, with most movies and Flash animations too slow to be useful, and it relies only on Bluetooth and Wi-Fi for connectivity. Unfortunately, VoIP and instant-messaging features have not yet been implemented, and the device accepts only RS-MMC memory cards. stevenf (dead link) reviewed Nokia 770 and said “I cannot recommend it for an average user at this time. Even a moderate-to-power user would be better served with a PDA or smartphone at double the price. Maybe if you JUST need the web browsing functionality occasionally for a room that does not have a computer, it’s worth it. But the rest of the suite is a wash as of the current software revision. Ars Technica concluded after review that “all in all, the Nokia 770 is a strange beast. It’s part laptop, part PDA, part laptop, and part media player. It’s small enough to fit in your pocket (well, my pocket anyway), and I could see sitting down in a cafe with a WiFi connection and catching up on news, correspondence, listening to some music, or watching a video. HowardForums (dead link) concluded that “I’ll be honest, my first impression when I saw the Nokia 770 Internet Tablet was that it looked pretty useless. It’s designed by Nokia yet it isn’t a phone. It looks like a PDA but lacks PIM functionality. What good is an internet tablet when you could have a PDA or a Smartphone? It turns out it’s actually pretty useful for surfing the web. The display is wide and big enough to make it feel like you’re browsing the web on a computer. Plus the 770 is fast enough that if you’re connected via Wifi, webpages load in a snap. On top of that you can always use the 770 as a music or video player though the fact that it uses RS-MMC cards limits the amount of content you can fit. Mobile Gazette also reviewed Nokia 770 and concluded that “The poor wireless LAN connectivity in our Nokia 770 is a very serious flaw, which is either a design issue or hardware fault. Otherwise, this is an excellent device with good inbuilt software. It works well with Bluetooth phones, and it is especially useful with a 3G handset. The inbuilt software still has a few rough edges and could do with some enhancements, but remember this platform is continually developing.